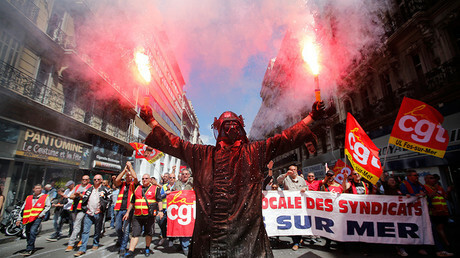 France's economy minister was left scrambling for safety when a group of angry union activists attacked him with eggs. It comes amid nationwide strikes and protests against a controversial labor reform law. 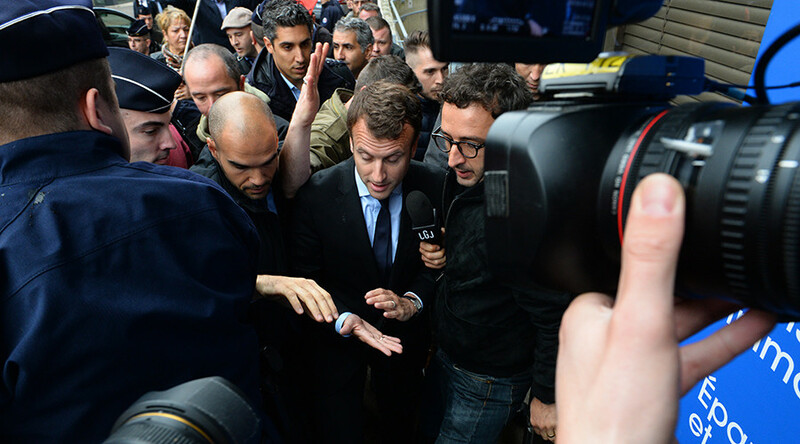 Speaking to reporters with yolk in his hair, 38-year-old Macron said the egging was the work of “professional agitators,” RFI reported. "They don't listen, they insult," said the minister, who was at the post office to launch a new stamp commemorating the 80th anniversary of the popular front government that gave French workers new rights. "It's all par for the course but it won't have any impact on my determination," Macron said, as quoted by Reuters. He added that there is no economic future for those who resist change. Macron has become a natural enemy of leftists in France, due to his firm agenda to reform the French economy by loosening rigid labor market rules and promoting flexibility and competition. He has been rumored to harbor a desire to run for president. The messy incident is the latest in a series of demonstrations and strikes against labor reform by the Socialist government of President Francois Hollande, which is furiously contested by the CGT. French rail strikes entered a sixth day on Monday, as ministers prepared to meet with the CGT and SUD-Rail unions in an effort to reach an agreement. Paris is desperate for the strikes to end, particularly as the Euro 2016 soccer championship is scheduled to kick off in France on Friday, bringing in 1.5 million foreign visitors. The tournament has been repeatedly used as a bargaining chip by unions and protesters, in an effort to persuade the government to scrap the labor reform law. Although Paris insists the labor reform legislation is aimed at deregulating the labor market and lowering the country's unemployment rate, those who oppose the law say it will make it easier and cheaper for employers to lay off workers.